I’ve been in the research phase of my degree for a couple of weeks, but all of my focus lately has been trying to pick myself up after David stomped on my heart. Now that I have that pretty much settled on a path to recovery, I can get back to the important part of my journey here: my dissertation. Today I put my work on fairy tales on hold so that I could meet with the director of the program and move on to the next phase of the degree. I finally figured out who my supervisor is (and I am happy to say that it is the woman that I wanted to work with) and have a mini plan for the next week before I start scheduling weekly meetings with my supervisor. I have decided to give myself a break from the research that I have been doing for the last three years in writing and basic skills education and work in a new area in education. I’ve decided to focus my attention on children’s books, and how the choice of book can determine how children learn about cultural stereotypes. I’m sure the research question will change a couple of times before I get it to something manageable. I had a lot of fun writing about something similar last semester on a smaller scale, so I am excited to get the work underway. First I have to tackle the essays for class. The essay on fairy tales will be finished tomorrow (fingers crossed) and I can start work on evaluating the lesson plan I created. On the best side note ever…..I have not heard about whether or not I have been readmitted to the PhD. program, but I got an email from the school about the current state of my residency. It appears that the school thinks I am Scottish and has invited me to fill out a lot of paperwork to prove that I am in fact a California resident. If I wasn’t going to be charged twice what an in state student pays, I would let them think I was an international student….might help my chances of being readmitted. 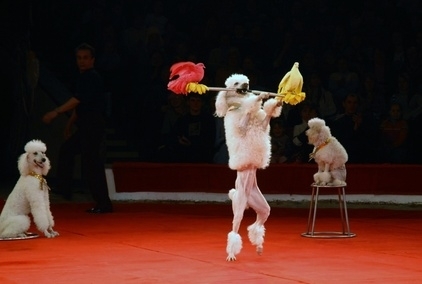 I’ve jumped through so many hoops lately I am starting to feel like a trained circus poodle. So funny! Well, little Lassie, I hope you enjoy your American adventure.